Carlos Ghosn has had a good run as the dual head of Nissan and Renault. In Japan, he was hailed as the rock star CEO who saved a national icon from doom and drove it to record profits. But that has changed, and Nissan is poised for its first annual loss since his takeover. At a press conference this month, Japanese reporters assailed him with questions about his personal responsibility for the current mess. Ghosn cant be blamed for the global meltdown hammering Nissan and the entire industry. But the unprecedented crisis makes it easy to see that his two hats are getting too heavy. When he added the reins of Renault SA to those of Nissan Motor Co. in April 2005, Ghosn boldly decided to be CEO of the two carmakers simultaneously. But now is the time for Ghosn to think about making a clean break and creating a fully empowered CEO for Nissan. Nissan has warned of a ¥265 billion (about $2.83 billion) net loss for the fiscal year that ends March 31. It will be Ghosns first loss since taking charge of Nissan in 1999. So it seems clear: Ghosns shuttling between Paris and Tokyo is not the best way to run both companies as the market implodes. Ghosn: Time to lighten the load? Ghosn conceded as much when he reshuffled the top brass at Nissan on Feb. 9. Toshiyuki Shiga, the COO, will be the new hands-on man. All corporate executives will report to him. Colin Dodge was elevated from head of Europe, India and the Middle East to take on the new role of chief recovery officer. It will be Dodges duty to dig Nissan out of the doldrums. 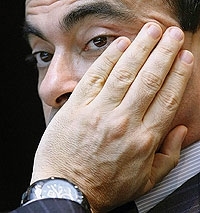 Ghosn called the moves nothing new, just a mirror to the shuffle last year at Renault when Patrick Pelata was appointed COO to free Ghosn for more strategic decision making. In a situation of crisis, you have to make sure you are doubling your attention, Ghosn said. Exactly. Dump the distraction; sharpen your focus.